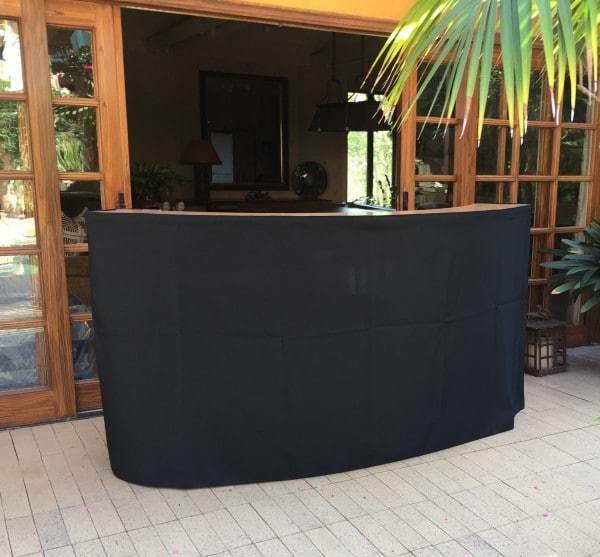 Our 7 Ft Serpentine Bar table offers a half round bar perfect for any event. Also at a low rental price and a modern look, this product is ideal for all events. The design of this bar makes it highly functional. Allowing the bar tender to store items under the bar while hiding service items from guests view! Finally, add a touch of professionalism for every event. Furthermore this bar comes complete with linens in your choice of white or black. Skirts are offered in pleated and straight. As a result the serpentine bar is easy to pair with a 6ft back bar, ice coolers, and self serve drink dispensers. In addition hired bar tenders will thank you because the design allows ease of use for staff. Create movement in your design. Consequently, if you are looking for this shape to continue your look, try our serpentine tables as a buffet or appetizer table. **See below photos for linen options, if not specified when ordering the serpentine bar will match color choices of your table linens with a two piece skirting.